It seems like everyone this week, myself included, is in the hacking throes of a spring flu. I look like death, warmed slightly. 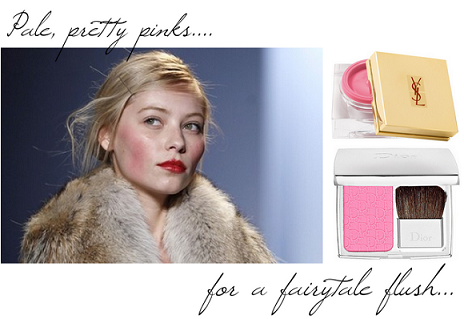 So it seemed a perfect time to pull out that most reviving and brightening of of spring looks - the candy-floss flush. My favorite incarnation of this bright cheeked look was on last year's runways, when Michael Kors sent out models with delicately pinned, flyaway hair, translucent skin and a cool, natural flush. They looked like English roses caught in a chilly spring breeze, with a disheveled, 1930's, Love in a Cold Climate-vibe that was makeup perfection. Let's be honest - these sorts of colors look absolutely terrifying in the pan, so cool-toned and bright, and I'm the first to veer away from them on the makeup counter. But be brave and play around with them - you'll be surprised how natural, sheer and soft they look, a much sweeter, clearer flush than the usual warmer tones impart. Hands down favorites here at the Blossom Shed are Dior's Rosy Glow Awakening Blush, for its impossibly fine and miraculously adjusting powder finish, and YSL's Creme de Blush in Babydoll, for its sheer, featherweight texture and gorgeous glow. Both blend beautifully with skin, seeming to impart a flush from within, and are perfection paired with long, glossy lashes and artfully disheveled hair.